Has anyone ever told you to “BYOHF” in terms of contributing to a social event? Probably not since I just made up this acronym, in my world it would stand for “bring your own healthy food”. 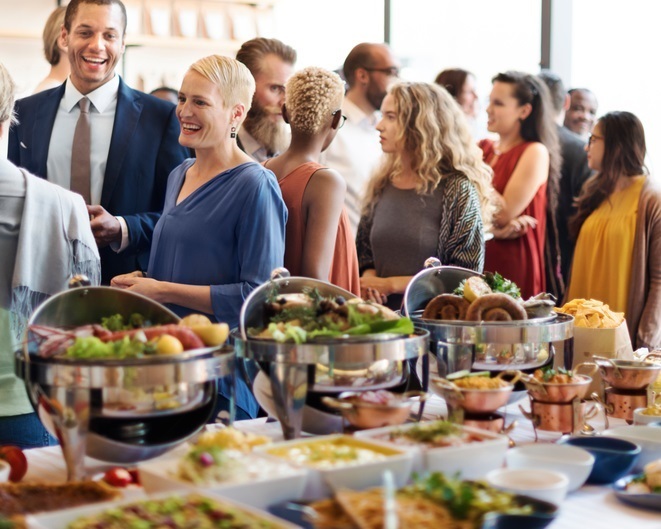 ‘Tis the season to discuss healthy eating at parties, ranging from office holiday parties, social events, and of course extending into the Super Bowl (and yes, the Vikings do have a chanceJ). Many people are trying to follow a healthy eating plan to avoid weight gain. Quite frankly, parties can be a trigger to overindulging and falling into the “what the heck” response in forgoing previous healthy habits. Here are some simple tips to follow to keep you on track at parties this holiday season. You must eat! Strategize and avoid setting yourself up for being over hungry later. Start your day off with a balanced breakfast and lunch; remember the MyPlate method of whole grains, lean protein, non-starchy vegetables, and fruit. You may choose to eat lighter meals. Eat a snack including protein prior to the party so you won’t be over hungry. Socialize! Remember, the reason for the party is catching up and connecting with others. When you are socializing, try to do this away from the buffet table, it can be too tempting to grab extra food mindlessly. “BYOHF” I realize this isn’t an approved acronym, but bring a healthy dish to share. If you don’t feel like cooking, bring a vegetable tray. This way you know there will be a healthy option at the party. Try filling half your plate with produce. Give yourself permission to enjoy! Indulge in your favorites and savor them. Don’t waste time and calories on foods that don’t interest you. Some of these foods come around only once a year. Rethink your drink. Drink water before having an alcoholic drink. Calories from mixed drinks can add up real fast, i.e. there are 95 calories in just 1 tablespoon of Tom and Jerry’s batter, yikes! Ask to sip on sparkling water with lime to keep things fizzy fun and healthy. Hope you find that implementing these tips can help you stay on track at parties this holiday season. Cheers! Tips adapted from the Academy of Nutrition and Dietetics, eatright.org.